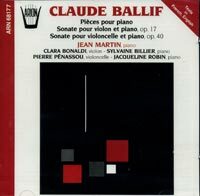 Description: Ballif's piano music is an unusual and curious amalgam of 20th-century styles. Based on various serial systems, more or less freely used, there is at times a sense of Webernian restraint and aphoristic enigma. But frequently the composer gives rein to a more extrovert style, and then one thinks more of Messiaen, and even Scriabin. Although he studied at Darmstadt, and was a research assistant of Pierre Schaeffer, there is not much tendency toward unorthodox methods of sound production here (some extended techniques are used in the cello sonata). For the most part these pieces sound like rigorously disciplined serial works with a very French sense of fantasy and impressionistic color.